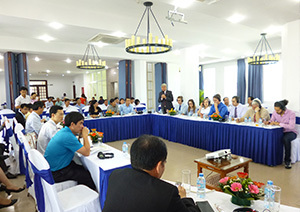 A seminar on the establishment of university/college co-op by Socodevi was held in Da Nang City, Vietnam on March 4-5, 2015. National Federation of University Co-operative Associations (NFUCA) was invited to introduce about university co-ops in Japan. 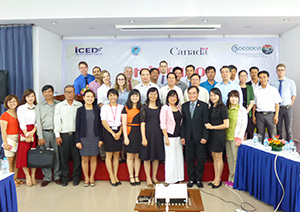 There were 50 participants from Vietnam, including Vice President of the Vietnam People's Party, Vice Chairman of Vietnam Cooperative Association (VCA), Da Nang Cooperative Association, Socodevi Coordinator, Chairman of Vietnam Youth Committee, and Vice President of Vietnam National University Hochiminh City University of Social Sciences and Humanities. Guest participants from other countries were 5 people, which included NFUCA and directors and students from COOPSCO, Canada. The Government of Vietnam is thinking to establish university/college co-ops as part of Da Nang Economic Development Plan. Da Nang is the third biggest city in Vietnam. This seminar was held to get an understanding on the current situation of Vietnam, to learn from Japan and Canada, and to get the opinions and support from those who were involved in the policy-making of Da Nang economic policy. In Vietnam, the first university co-op was established in 1996, which has become the place to learn about cooperative-style management, but the university co-op does not have competitiveness yet in the market. The university co-op has been challenged by various problems, for example there are a lot of stores outside campus that offer very low prices. The competition is severe, and it is very difficult to maintain the business. The participants agreed that it is very important to spread the co-op value and for the students who understand the spirit of co-op to become entrepreneurs in the community. These two things will contribute greatly to the establishment of co-op.